Having a good quality leash can help teach the dog what they are allowed to do and what they are not. With all of the choices of dog leashes available, there is one for every dog and dog owner. The number of different choices a dog owner has for a dog leash can be mind boggling when you are trying to choose which dog leash to get. We did extensive research that involved getting the top 20 dog leashes and comparing them to each other on different points including durability, strength, ease of use, performance, size ranges, warranties offered and more. These three dog leashes reviewed above topped the charts in all of these categories. The major job that a dog leash has is to guide the dog while on walks and to keep them in line. They are a vital training tool in teaching the dog how to behave when used properly. They are great for keeping a dog right with the dog owner, especially when it is not proper or safe for the dog to be running around loose. No one likes a wild, out of control dog that jumps all over everyone. This retractable leash from Flexi is a leash that is designed for large dogs that weigh 100 pounds or less. It will extend up to 26 feet, providing the large with plenty of room to smell their surroundings and explore. It is the perfect leash for walking your dog in open areas. Each package comes with a safety collar and directions as well. The Flexi Explore retractable dog leash features a one-handed braking and recoil system that ensures you have complete control over your dog during the entire walk. The ergonomic handle is easy to hold and adjust the leash to whatever length you need based on where you are walking the dog. The convenient lock button will hold the leash at a constant length when you need it. Make sure that you use the included safety collar as well when you are using the flexi retractable leash. Dog owners will have 3 sizes and 3 colors to choose from and will have a 2 year manufacturer’s warranty that covers the leash as well. The warranty covers defects in workmanship or mechanisms and not damage from chewing, rough surfaces or other misuse. 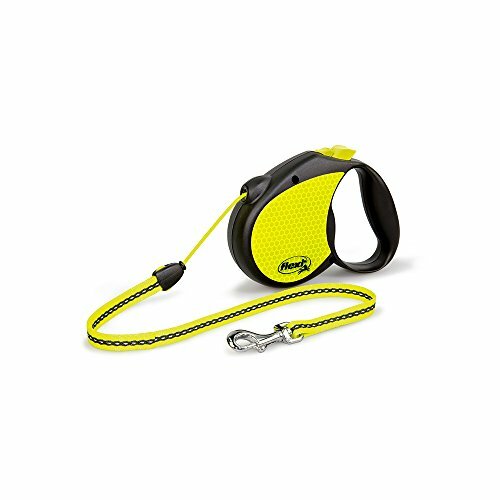 This Flexi Neon retractable leash is the perfect leash for smaller dogs up to 44 pounds. It has reflective stickers and neon colored features that increase visibility when walking in lowlight conditions or even when it’s dark outside. The 16 foot capacity provides your dog with plenty of freedom of movement without compromising safety. The one handed brake feature makes adjusting the leash to different lengths very simple to do. Flexi Neon leashes are available in small, medium and large sizes, each for a certain weight limit. This retractable leash is very sturdy and will last a long time providing it is not used with a dog that is above the weight recommendation. Overall the flexi leashes are very strong and well suited for larger stronger dogs. The reflective sticker on both sides of the leash’s casing will reflect headlights from up to 160 yards away. Additional visibility comes from the brightly neon leash and brake button. The leash retracts and rolls out smoothly and easily. The double layer design of the PetsLovers Durable Dog Leash Pet Lead makes a very sturdy dog leash that has a much lighter weight than leather leashes do. Because of its strength people have used this dog leash as a horse lead as well. The padded handle protects users’ hands from getting a burn from the leash sliding through their fingers. The leash measures 6 feet long, making it the perfect length for walks around the neighborhood or on a trail. 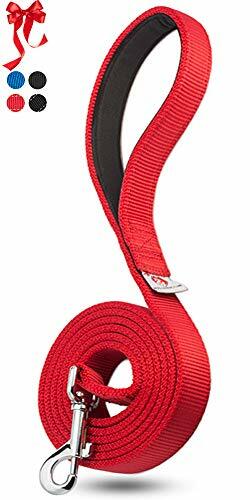 The bright red of this PetsLovers leash enhances visibility and helps keep your dog safe. This makes a great gift for a dog owner. This is a superior leash and anyone you give it to will love the leash even more once they use it with their dog. Petslovers is a family owned business and they offer a better than money back guarantee. If you are not happy with the leash for any reason, you can contact the manufacturer and they will give you your money back. They also give you the option of donating the leash to a local shelter. To find the top three dog leash winners, we did extensive research that involved getting the top 20 dog leashes and comparing them to each other on different points including durability, strength, ease of use, performance, size ranges, warranties offered and more. These three dog leashes reviewed above topped the charts in all of these categories. Continue reading below to learn even more information about choosing the right dog leash in our informative buyer’s guide. When you have all the information you need about a product, it makes sorting through a large selection much easier. Having a good quality dog leash is a must when you own a dog. Even if you don’t have to take your dog on walks in the city, you will still have the need for a good leash when you take your dog to the vet or travel with him or her. Most places have leash laws, so you will need to follow those and ensure that you have a good leash on hand. Before you purchase a dog leash, make sure you have information on the different types of dog leashes, the materials used to make them, and the specific factors that determine which type of leash works the best for you. Choosing the right leash is a very important decision to make. Since a dog leash is probably one of the most important training tools you will buy, you need to choose one that fits your dog’s lifestyle. Remember that a dog leash, even an excellent, high quality one, can’t replace training, but it certainly can help the training process. There are many different types of dog leashes available for a dog owner to choose from. Ultimately, you only need to worry about 4 basic types of dog leashes. These four are the most common types that are used. Standard – As its name implies, this leash is the most common type of leash purchased by dog owners. Standard dog leashes are used for basic types of training and daily dog walking. Most standard dog leashes measure anywhere from, 4-8 feet long. The ideal length for a standard leash is 6 feet. Standard leashes can be made out of nylon, chain, leather, rope and other materials as well. The majority of dog trainers prefer standard leashes for starting puppies off on the right paw. Retractable – A retractable leash is a lot like a tape measure. The dog owner holds the handle of the leash and the end attached to the dog can roll out and retract as the handler wants. Most retractable leashes contain nylon cord or bands that can provide as much as 26 feet of slack that will retract back into the case, which is usually made of plastic. Retractable leashes are best suited for dogs that have already learned how to walk properly on a dog leash. Adjustable – Adjustable dog leashes are between standards and retractables. The design of an adjustable leash is very close to that of the standard leashes but there are several loops along the length of the leash that allow you to adjust it to the length you want. 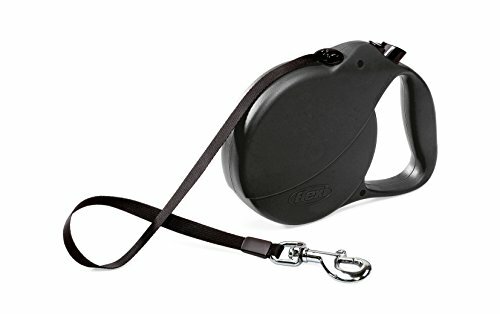 Adjustable leashes are very good for rewarding the dog with more walking length without allowing them too much freedom. Martingale – What sets martingale leashes apart from others is the fact that the leash and collar is one unit. This is a very good style of dog leash for smaller dogs. The way it works us the collar slips over the dog’s head and will tighten when the handler pulls the leash. Even though Martingales can be used for larger breeds they are recommended for the smaller ones. The most important factor in choosing a leash material is finding something that is durable. The stronger the material is that is used for the leash, the less likely it is that the dog will be able to destroy the leash by chewing through it. Nylon – This is one of the most common materials used in dog leashes. It is durable and strong and will not constrict if it gets wet. Nylon is a very inexpensive material as well and comes in a variety of colors. The only drawback to the nylon dog leash is that it can wear on your hand and also cut into the dog’s neck so care must be taken when using it. Cloth – Cloth is not a real big favorite with dog owners for several reasons. It frays easier than nylon, can tear and dog’s can chew through it relatively easily. Cloth leashes cost about the same as nylon and there are no real significant benefits to using them so they are getting less and less popular. Leather – Leather is the most expensive material that is used to make a dog leash but it is also the one that will last the longest. The durability of leather is one of the reasons it costs more but people don’t mind the cost since the value is so superior. They don’t fray, they are impossible to chew through and there are many designs that appeal to all kinds of dog lovers. Chain – Chain leashes are not as popular as they once were, but they are still used by some dog owners. Although professional dog trainers very rarely if ever use chain, some people like the look or feel it is better for their particular dog. Reflective – Reflective leashes are leashes that have reflective elements on them that make it easy for people to see them in the dark. They are good safety measures that protect the dog and handler when taking walks in the dark or early morning hours. There are three main factors that you want to consider before you purchase a leash for your dog. We’ve listed them below for your benefit so when you start shopping you know exactly what to look for. Length – The length of the dog leash you choose decides the amount of freedom your dog has as you walk. Length is a feature that us prevalent in standard, retractable and adjustable leashes. When you are first walking your dog on a leash and getting them used to it, you want less freedom of movement while they are learning how to behave properly. Length is one of the most important factors for deciding on a leash. Clip – The clip that is on the end of the leash and that attaches the dog to the leash is very important. When this clip is weak, it can break with the least amount of resistance. Make sure that the ring and the clip that is attached to the ring is strong and rust-proof which means making sure it is made from stainless steel. Durability – Unless you want to replace your dog leash repeatedly, you should take a little bit more time to research and choose a leash that will be durable and tough and stand up to the rigors that it will go through. Another reason to make sure that the dog leash you choose is sturdy and durable us because of the safety a sturdy, well-made leash provides. Here are some good do’s and don’ts as you are purchasing your dog leash. These tips are designed to help you choose the perfect leash for your dog. DO… Look for a dog leash that will give you the most control over your dog. This can also mean making sure you know which types of leashes work well for certain breeds. The leash needs to be long enough to give the dog some slack but also short enough to ensure you have control over them as well. DO… Look for a dog leash that has a width that correlates with the dog’s size. Large dogs do better with wide leashes. If your dog grows fast, a wide leash will work well for them also. DO… Look for a dog leash that provides comfort and safety for your dog while you are training it. Never compromise your dog’s safety or comfort for price. DO…Buy more than one dog leash. Aside from having a backup if something goes wrong with the first one, or it gets lost, you should buy leashes that will work for the different stages your dog will go through during their leash training. DON’T… Don’t use a chain leash even on the breeds that are considered to be more aggressive and challenging. Chain leashes don’t make good training tools and if used incorrectly, they can injure the dog. DON’T… Don’t waste money on decorative dog leashes. Those with tassels, glitter and other embellishments can choke a dog if they are able to get them off of the leash. A dog leash is meant to train and keep the dog in check. Having decorative items on them can be a distraction and hazard. DON’T… Purchase a retractable leash for a dog that is not trained to walk properly on a leash. If they dart off to the side or are constantly pulling, they can tangle themselves around objects or even passersby and cause themselves, you or someone close by injury. DON’T – Never buy a leash with the intent of tethering your dog. This is not the way to train them and it can lead to chewing and other attempts to free themselves which can cause injury to the dog. One of the single most important training tools you will buy for your dog or puppy is their leash. They are invaluable for teaching your dog to walk properly when you take them out or to the park and it teaches them how to behave and what it expected of them. Now that you have learned some of the more important factors involved in choosing the right leash you can sort through all the choices available and decide on the one that will meet the needs and preferences you have and want for your dog.